Celery is packed with essential vitamins and minerals such as vitamin C, K, And B6 as well as folate and potassium. Its health benefits are due to the excellent sources of beneficial enzymes and antioxidants. Regular consumption of celery is beneficial for people with high cholesterol and blood pressure levels. It can also protect cardiovascular health and has amazing benefits for the eye, skin, liver and cognitive health. Celery can be added to soups and stir-fries. Its seeds contain an oil compound known as apiol, which contributes to a distinctive flavor and many medicinal uses. Some of you may not be a fan of celery. However, you have to know that regular consumption of this vegetable can provide various health benefits for the body. Celery has many digestive benefits due to its diuretic effect. 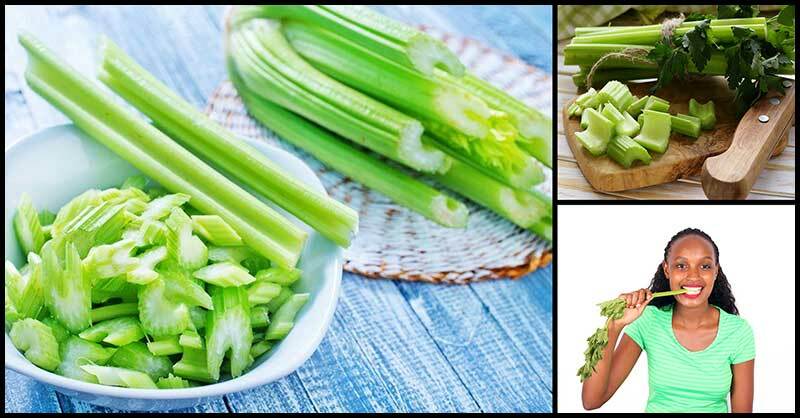 The good amount of fiber in celery can boost digestion, relieve bloating and treat water retention. Celery contains a special type of ethanol extract which is effective in preventing the formation of ulcers in the lining of the digestive tract. Some of the beneficial chemicals that can help nourish the stomach, intestines, and colon is alkaloids, tannins, flavonoids, and volatile oils. A large celery stalk can provide your body with 5 percent of your daily need for vitamin A, which is a nutrient needed to protect the eyes and prevent age-related degeneration of vision. Celery is high in fiber, super low in calories, and rich in nutrients needed for weight loss and to boost your metabolism. Celery is packed with antioxidants and polysaccharides that have anti-inflammatory properties. This can help lower inflammation in many chronic diseases such as heart diseases, arthritis, and cancer. Eating celery on a regular basis can help prevent bacterial infections within the production organs and digestive tract. Due to this, urine production is boosted and uric acid levels are decreased. Celery has been found to be effective against cysts on the reproductive organs, urinary tract infections, bladder disorders, and kidney problems. Celery has a calming effect on the nervous system. Drinking a cup of celery juice before going to bed every day can help you sleep well. An active compound called phthalides in celery has been proven to boost circulatory health by relaxing the muscles around the arteries. Raw, whole celery reduces high blood pressure.